This section of Rules most closely resembles the Seasons & Events functions you may be used to. 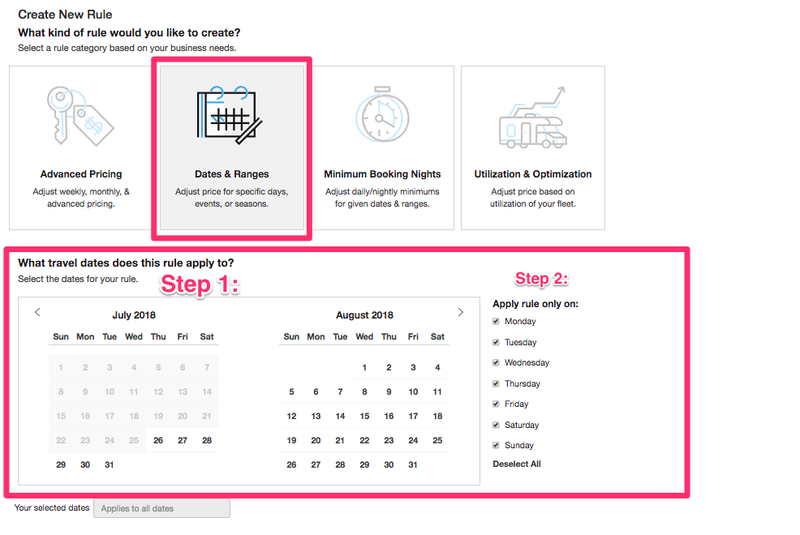 By selecting dates for travel (and days of the week), dates the rule is active, and how you'd like the price to change, you will have created a price change for those dates. Fall Pricing from Aug 1 - Oct 31 that increases the price by 10% and only applies Friday, Saturday, and Sunday. You'll find days of the week to the right of the date picker. Utilize these if you want this rule to only apply to certain days of the week. Any un-selected days will not be affected by this price change. Step 5: Choose whether you want the rule to become active right away or not. Step 6: Click "Create Rule"